While coming to us here at 2007RunescapeGold.com is the easiest way to buy Runescape Gold. 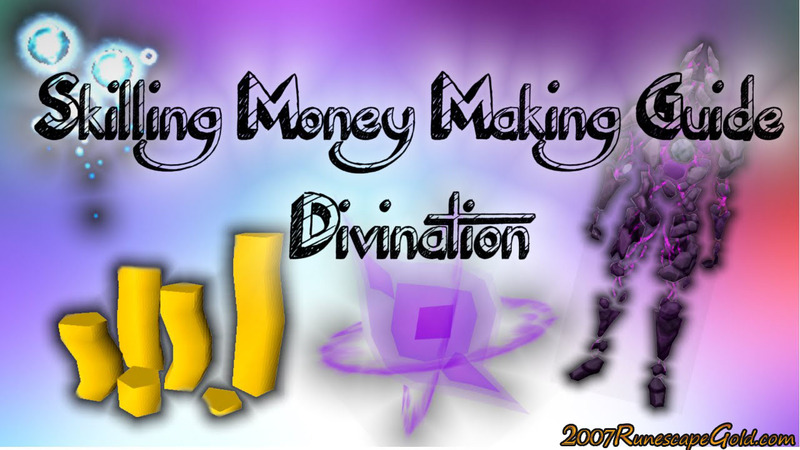 We also love to share with you ways that you can make some pretty decent money in the game yourself and that is what we are doing today with this Divination money making guide. Before that, you can check out ours Divination Training Guide. The only real requirement that you need for this rather simple method is 96 Divination. You will be making Runite Ore which is something that is highly sought after by those who have higher level Smithing. Runite Ore is pretty rare and it is actually around six times the price of Adamantite Ore! What you will be doing is making 1 Runite Ore by transmuting 6 Adamantite Ores via using 10 Incandescent Energy. Doing this gives you a profit of 1,071. You can do this 4 times per inventory and if you are using bank presents, you can do it in under ten seconds so you can get a lot done in an hour. It is worth noting that if you have a Modified Diviner's Headwear, you can reduce costs considerably as you will be saving 5 percent on Incandescent Energy. Also if you have a Diviners Outfit, this can give you a boost in the experience you will get as well. While this may not be the most profitable way to make money, it is very, very easy and a great way to boost your money if you have a spare hour and are looking for something simple to do. Want to become a millionaire in 2017? You can check this Runescape Money Making Guide.